Oh me, oh my! I’m a fool for these hearty vegan burgers. I had 1 for breakfast with sliced avocado, and 3 for dinner. Thankfully the recipe makes 12-14 burgers, because they are so good! I’ve been making sweet potato burgers for some time, but have just now gotten around to writing down my recipe. For these burgers you’ll need a food processor to slice and dice the ingredients at each step. If you don’t have one, I’m sure you could mince and chop vegetables by hand, and mash the garbanzo beans with a fork. Keep in mind, the recipe calls for two cans of chickpeas (nearly 4 cups), so that would be a lot of fork mashing. Arm workout! I’ve always been a burger fan. I can proudly say I have never in my life eaten a classic red meat burger (phew! ), but I did grow up loving Nana’s turkey burgers. I thought salmon burgers were pretty good too. My first introduction to veggie burgers was in the form of a frozen patty. At some point my mom started buying Dr.Praeger’s frozen veggie burgers at Costco. They were so good. She really doesn’t enjoy cooking, so she’d stick them in the microwave, and voila! 1 minute later you’ve got a burger! Me, I’d cook them in a skillet with a little oil to make the edges crispy. mmmmm! I’ve since moved on from frozen burgers, and now I’d rather make my own veggie burgers from scratch. I find it to be a deeply rewarding process, and it really isn’t difficult at all (as long as you’ve got a food processor). 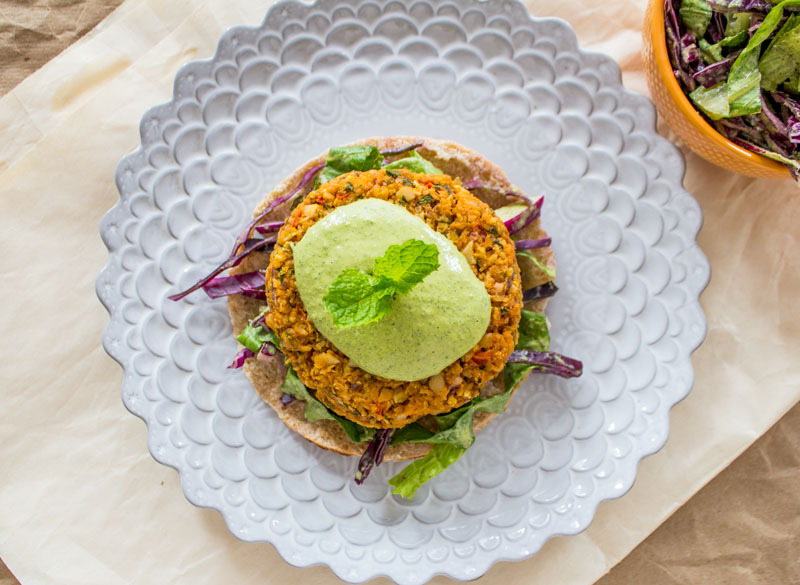 Homemade veggie burgers are extra amazing because the combinations are endless. I love Sweet Potato Burgers, but sometimes I’m craving a Black Bean Beet Burger. Sometimes I want to use cilantro, other times parsley. Black beans one day, chickpeas the next. I gotta tell you, my favorite way to eat a veggie burger is without bread. Bread is fine, but sometimes it dilutes the flavor of the patty. 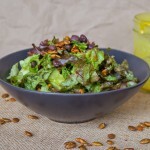 Crumbled over a salad is a fabulous way to eat a burger too. Especially these. 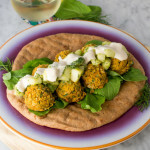 Or, you could serve these with shredded cabbage and romaine within a mini pita, with a generous dollop of green tahini sauce (made with fresh herbs). It’s really up to you! 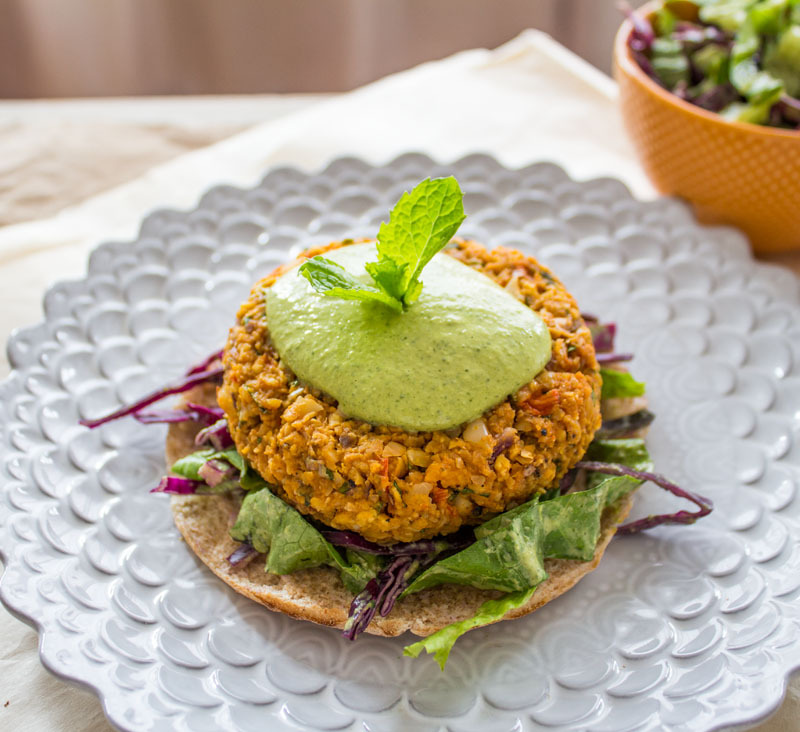 What’s your favorite veggie burger recipe, and how do you like to eat it? In a food processor pulse and chop the red bell pepper and red onion. Pour the chopped veggies into a large mixing bowl. Place the chickpeas and cilantro/parsley into the food processor and blend until the chickpeas are a thick mealy texture. Pour into the mixing bowl with peppers and onions. Place the garlic, almonds, and spices into the food processor and blend until the almonds are a crumbly texture. Pour into the mixing bowl. Mash the sweet potato with a fork, or place it in the food processor and blend until smooth. Pour it over the contents of the mixing bowl followed by the oats, and stir well to combine the ingredients. Season to taste with more sea salt and spice. Place the burger batter in the refrigerator to firm up for an hour or longer. Preheat oven to 375°, and line one or two baking sheets with parchment paper. Scoop about ¾ cup of the batter into your hands and form into a tight patty. Place the patty onto the baking sheet, and repeat with the remaining batter. Make sure that the patties are not too close to each other on the baking sheet (2 inches separating is good). Bake for 40 minutes, or until cooked through. After removing them from the oven, allow the patties to cool for at least 15 minutes before trying to remove them with a spatula or your hands. Serve with green tahini on bread, lettuce, or solo. Bon appetit! Place the tahini, water, lemon, herbs, and sea salt into a blender. Blend until smooth, slowly add in the olive oil. 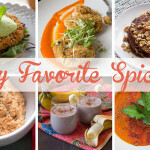 A Meal in the Life + a tasty GIVEAWAY! !